George Weasley (b. 1 April, 1978) was a pure-blood wizard, son of Arthur Weasley and Molly Weasley (née Prewett), brother of Bill, Charlie, Percy, Ron, Ginny, and twin brother of the late Fred Weasley. George's first few years were marked by the height of the First Wizarding War and when Lord Voldemort fall for the first time. He attended Hogwarts School of Witchcraft and Wizardry from 1989 to 1996 with Fred, and was Sorted into Gryffindor house. He and Fred were popular students, becoming Beaters for the Gryffindor Quidditch team in their second year, and members of Dumbledore's Army in their unfinished seventh year. A born prankster and inventor, George left Hogwarts prior to graduation to become a successful entrepreneur, alongside his twin brother, and opened the joke shop Weasleys' Wizard Wheezes at 93 Diagon Alley. He was a member of the Order of the Phoenix and fought in the Battle of the Seven Potters and the Battle of Hogwarts; in the latter, Fred died, leaving George devastated. Sometime after the end of the Second Wizarding War, George married Angelina Johnson, with whom he had a son he named Fred, in honour of his late twin, and a daughter named Roxanne. He and his brother Ron also turned Weasley's Wizard Wheezes into a huge money spinner. Fred and George Weasley were born 1 April, 1978; April Fool's Day, appropriately, as he and his brother Fred were mischievous pranksters. George was raised at his family home of the Burrow, near Ottery St. Catchpole in Devon, England. He and Fred were younger than siblings Bill, Charlie, and Percy, and older than siblings Ron and Ginny. Although the family was poor, they were loving and happy. George and Fred were troublemakers from a young age, delighting in playing clever pranks and in teasing their siblings (especially Percy), and it was a challenge for their mother to try to keep them under control. It was not uncommon for explosions to be heard coming from the bedroom they shared. Some of the stunts they pulled as children include setting a Dungbomb off under their great-aunt Muriel's chair during a Christmas dinner, turning Ron's teddy bear into a giant spider after Ron accidentally broke Fred's toy broomstick, giving Ron an Acid Pop which burnt a hole in his tongue, and nearly tricking Ron into taking an Unbreakable Vow. Fred: "Don't worry, Ginny, we'll send you loads of owls." George: "We'll send you a Hogwarts lavatory seat." George was educated at Hogwarts School of Witchcraft and Wizardry from 1989 to 1996, and was Sorted into Gryffindor House. He and his twin brother made very good friends with fellow Gryffindors Lee Jordan, Angelina Johnson, Alicia Spinnet, and Oliver Wood, and became well known for their senses of humour. During their first year at Hogwarts, George and Fred swiped the Marauder's Map from Argus Filch's office, which further aided in their mischief. In his second year, George gained a position on the Gryffindor Quidditch team as a Beater, as did Fred. They were both extremely skilled players, described by Oliver Wood as being like "human Bludgers". It was said to Harry Potter by their youngest brother, Ron, that Fred and George achieved "really good marks", at least in their early years. George started his third year in 1991, when his younger brother Ron began his first year, along with Harry Potter, who soon became his best friend. Harry joined the Gryffindor Quidditch team as its Seeker, and became friendly with George and Fred as well. For Christmas, Harry received a Weasley jumper along with George, Fred, Ron, and their other brother Percy. The twins' jumpers had their initials on them, prompting George to quip that they knew they were "Gred and Forge". George also insisted that his older brother Percy wear his jumper and sit with his brothers instead of the other Prefects, reminding him that the Christmas holidays were a time for family. He, along with the rest of the family, was immensely proud of Ron when the latter beat Professor McGonagall's giant chess set. George was also on the Gryffindor Quidditch team that had the worst loss in 300 years in the Quidditch final without Harry as Seeker because of his encounter with Quirinus Quirrell. While Harry was unconscious in the hospital wing, George and Fred attempted to send Harry a toilet seat, showing their friendly side toward him. Percy: "This is no laughing matter!" Fred: "Oh, get out of the way, Percy. Harry's in a hurry." George: "Yeah, he's nipping off to the Chamber of Secrets for a cup of tea with his fanged servant!" In the summer of 1992, before his fourth year, George, Fred, and Ron rescued Harry from his relatives' home, picking the lock through Muggle methods. The four boys then flew to the Burrow in their father's enchanted car. When the school year began, George and Fred took to teasing their younger sister Ginny, who was starting her first year. They were trying to cheer her up, unaware that she was under the influence of Tom Riddle's Diary and thus emotionally fragile. That year, the Chamber of Secrets was opened and rumours were circulating that Harry was responsible for it, since he spoke Parseltongue and thus might be the Heir of Slytherin. Neither George nor Fred took these rumours seriously, and frequently joked about it. They also came to Hermione Granger's defence when Draco Malfoy called her a "filthy little Mudblood", lunging at him, only to be blocked by Marcus Flint. After Gryffindor won the Quidditch match against Slytherin, George went to the Hospital Wing with the rest of the Gryffindor Quidditch Team to see Harry because Gilderoy Lockhart had removed all his bones and congratulated him for his unbelievable flying, but not before seeing Marcus Flint yelling at Draco Malfoy for "having the Snitch on top of his head and not noticing", which he informed Harry of. At the end of the school year, George was relieved when his younger sister was saved - and delighted when she revealed that Percy had a secret girlfriend, as this was another opportunity to tease him. That summer, the Weasley family took a holiday to Egypt, where Bill was working as a Curse Breaker. While there, Fred and George tried to push Percy, who had been acting even more arrogant than usual because he learned he had been appointed Head Boy, into a pyramid. Their mother stopped them and scolded them severely. They went in all pyramids, annoying Ginny when she couldn't go in the last one. George: "This, Harry, is the secret of our success." Fred: "It's a wrench, giving it to you, but we decided last night, your need's greater than ours." George: "Anyway, we know it off by heart. We bequeath it to you." In 1993, George began his fifth year at Hogwarts. Around Christmas, he and Fred decided to give the Marauder's Map to Harry Potter in order to help him get into Hogsmeade without permission, as they had already memorised it. They also comforted Harry when he was upset by the presence of Dementors at the school that year, and somewhat comforted Ron after his pet rat Scabbers went missing. This was also the year that George and Fred took their Ordinary Wizarding Level examinations, earning three OWLs each. In the summer of 1994, George attended the Quidditch World Cup with his family as well as Harry and Hermione Granger. They gambled on the outcome, and won a great deal of money because of it. However, Ludo Bagman defaulted on the bet. Fred suggested threatening to inform the Ministry of Magic of Bagman's activities, but George was against it, arguing that it was blackmail. That year, George and Fred also started trying out the prank devices they invented, starting with the Ton-Tongue Toffee on Dudley Dursley. Once at school for their sixth year ( before their sixth year, they attended the Quidditch World Cup ), George and Fred began selling as well as experimenting with their inventions. That year, Hogwarts also hosted the Triwizard Tournament, which Fred and George both wanted to enter, despite being underage. They attempted to fool the Age Line Spell that Albus Dumbledore put around the Goblet of Fire using an Aging Potion, but the attempt was unsuccessful though they both thought their beards were uproariously funny. Later that year, George danced with his chosen partner at the Yule Ball. At the end of the school year, Cedric Diggory, one of the champions, was murdered by Peter Pettigrew on the orders of the newly revived Lord Voldemort, who was reborn. Harry surprised the twins by giving them the one-thousand Galleons he won in the Tournament in order for them to start up their joke business. They were extremely grateful, and promised Harry free merchandise. Molly: "I don’t believe it! I don’t believe it! Oh, Ron, how wonderful! A prefect! That’s everyone in the family!" George: "What are Fred and I, next-door neighbours?" George spent the summer of 1995 in 12 Grimmauld Place, the headquarters of the newly reconstituted Order of the Phoenix, along with most of his family. He and Fred pocketed Doxies while cleaning up in order to use in their experiments, and spied on Order meetings using their Extendable Ears invention. They had also passed their Apparition tests "with distinction", and delighted in annoying other inhabitants of the house by frequently Apparating and Disapparating around the house. When Ron and Hermione received news that they were Gryffindor's new Prefects, George was slightly disgruntled by their mother's overjoyed reaction, and he and Fred both taunted Ron. Although neither George nor Fred were very concerned about completing their educations, they returned to Hogwarts for their seventh year, and continued to develop and sell their joke products. Hermione managed to stop them from testing out their products on younger students after threatening to tell their mother that they had been tricking first-years into trying out treats from the Skiving Snackboxes, a threat George considered "below the belt". George and Fred also joined Dumbledore's Army, as they greatly disliked the new Defence Against the Dark Arts professor and High Inquisitor Dolores Umbridge and wanted to oppose Ministry control at Hogwarts as well as prepare to fight Lord Voldemort and his Death Eaters. Later in the year, Umbridge kicked George, Fred, and Harry off the Gryffindor Quidditch team and gave them all lifetime bans from Quidditch after George and Harry got into a fight with Draco Malfoy (although their bans were lifted immediately when Umbridge was removed from Hogwarts). The Slytherins had written the lyrics to the demeaning song Weasley is Our King, intended to humiliate Ron and undermine the Gryffindor team, and then insulted George's parents and Harry's late mother. Things would get worse for George and his family around Christmas, when their father was attacked by Nagini, Voldemort's snake. The Weasleys split their Christmas holidays between Order headquarters and St. Mungo's, although Percy did not visit and sent the jumper his mother sent him back unopened, continuing his estrangement. Fred: "If anyone fancies buying a Portable Swamp, as demonstrated upstairs, come to number ninety-three, Diagon Alley — Weasleys' Wizard Wheezes, our new premises!" Later in the school year, the D.A. was discovered, but Albus Dumbledore took the blame and left Hogwarts. George and Fred decided that they no longer cared about getting into trouble, and started an all-out rebellion against Umbridge. They shoved Inquisitorial Squad member Graham Montague into a Vanishing Cabinet when he attempted to dock House Points from them, set off a spectacular array of fireworks of their own making, and created a Portable Swamp in a corridor. In a flourish of vandalism and chaos, George and Fred flew away from Hogwarts, encouraging other students and Peeves to follow their examples. Umbridge: "You two are about to learn what happens to wrong-doers in my school." Fred: "You know what? I don't think we are. George, I think we've outgrown full-time education... Time to test our talents in the real world, d'you reckon?" Initially, Fred and George's ambitions to open a joke shop came as a disappointment to their parents, who had hoped they would seek employment with the Ministry of Magic like their father. However, the spectacular success of the twins' business, Weasleys' Wizard Wheezes, located at 93 Diagon Alley, immensely impressed his parents and made them proud. What had started out as a mail-order experiment in entrepreneurialism skyrocketed into a very lucrative undertaking. It was so successful, in fact, that in 1996, the twins had moved out of their childhood home and into a flat above the store. Later, the twins considered buying Zonko's Joke Shop in Hogsmeade, which had closed the previous year. George: "Come through the back, Harry, that's where we're making the real money..."
Fred: "We've just developed this more serious line. Funny how it happened..."
George: "You wouldn't believe how many people, even people who work at the Ministry, can't do a decent Shield Charm... And then we thought we'd get into the whole area of Defence Against the Dark Arts, because it's such a money spinner." None of this might have been possible without the funding Harry Potter had given them in 1995. For Harry's generosity, the twins allowed him to take any merchandise free of charge. In the summer of 1996, Harry, Ron, and Hermione Granger visited the shop and Fred showed Harry around. He also offered Hermione a Patented Daydream Charm for free after she called them "extraordinary magic", but still charged Ron for his purchases. Fred and George also questioned Ginny on her love life, much to her irritation. That Christmas, the twins stayed at the Burrow for the holidays. When Percy arrived with Minister for Magic Rufus Scrimgeour and it became clear that the two had only come so that the Minister could question Harry, George threw mashed parsnips at his older brother, along with Fred and Ginny, causing Percy to leave swiftly. When Harry Potter, Hermione Granger, as well as their parents and a few of their siblings visited their shop in the summer of 1996, the place was described as "packed with customers" to a degree that it was extremely difficult to get near the shelves. Fred and George had also created a Defence Against the Dark Arts line of products, such as "Shield Hats" and "Shield Cloaks" that were widely purchased by the Ministry for its staff. Throughout the school year of 1996 to 1997, the twins were able to disguise products to be sent into Hogwarts by mail order (even though all their merchandise was banned by Argus Filch) to the students. One of their services was to have their own line of Love Potion to be disguised as perfume bottles. They also bred magical animals such as Pygmy Puffs, which were miniature Puffskeins. George: "Saintlike. . . I'm holey. I'm holey Fred, ya geddit?" Fred: "With the whole wide world of ear-related humour, you go for 'I'm holey'. Pathetic." George: "Reckon I'm still better looking than you." George and Fred both joined the Order of the Phoenix once they were of age. They participated in the Battle of the Seven Potters, taking Polyjuice Potion to become one of the "seven Potters". George flew with Remus Lupin on a broomstick and lost an ear due to an off-target Sectumsempra spell fired by Severus Snape. However, he took this optimistically, and turned it into a joke, calling himself "holey" and also saying his mother would now be able to tell the difference between them. That same summer was his brother Bill's wedding to Fleur Delacour. George attempted to flirt with two "pretty French girls" who came to the Burrow to attend, but, unfortunately for George, Fred got to them first, leaving George to deal with a gaggle of middle-aged witches. When the war reached its worst point in late 1997 and 1998, George possibly participated in Potterwatch, a radio program hosted by his friend Lee that opposed Voldemort's reign of terror, as his brother Fred did. They spread the truth about the Death Eater regime that was not being reported by the Daily Prophet or other news outlets, and encouraged the public to support Harry and to protect Muggles who were falling victim to the Death Eaters. Later in the war, he and his family friends returned to Hogwarts to fight the invading Death Eater army; he and Fred were placed in charge of the defense of the castle's secret passages by Kingsley Shacklebolt. Fred was killed in an explosion while fighting alongside his brother Percy, which deeply devastated George. George and Lee Jordan were later seen defeating Yaxley. George also saw Harry Potter defeat Lord Voldemort, thus ending the war. George never truly got over Fred's death, but he eventually married Angelina Johnson, and named his first child Fred in loving memory of the twin brother he lost. The couple also had a daughter named Roxanne. George continued to run Weasleys' Wizard Wheezes to great success; his younger brother Ron helped him to turn the shop into a real money-spinner. George, like the other members of the Weasley family, sports flaming-red hair and freckles, and is shorter than his brothers Bill, Percy, and Ron, and somewhat stocky, like his brothers Fred and Charlie. However, he is still fairly tall, as he is mentioned as being taller than Harry Potter. As a result of an injury from Severus Snape's Sectumsempra during the Battle of the Seven Potters, George is missing his left ear, briefly distinguishing him from his identical twin until Fred's death. George: "What made you see sense, Perce?" Percy: "It’s been coming for a while... I managed to make contact with Aberforth and he tipped me off ten minutes ago that Hogwarts was going to make a fight of it, so here I am." George: "Well, we do look to our prefects to take a lead at times such as these. Now let’s get upstairs and fight, or all the good Death Eaters’ll be taken." George was the quieter, gentler of the twins, and not as cruel as Fred, who took on the role of ringleader, could sometimes be. George's sense of humour was not as harsh, and he was inclined to make fun of himself on occasion as well — even when he was injured and lost an ear. He also appeared to be slightly more moral, as he was against blackmailing Ludo Bagman when the former Quidditch player defaulted on a bet at the Quidditch World Cup. However, he still displayed a slight vindictive streak when it came to dealing with people he disliked; for example, he and his brother Fred had absolutely no compunction in forcing Graham Montague into a Vanishing Cabinet, an act which nearly killed him, according to Draco Malfoy. George's prankster nature is enjoyed by nearly everyone in his family, aside from his brother Percy and his mother, who both consider jokes to be immature and childish. However, his pranks targeted at Percy were usually good-natured, and the only thing that got hurt was Percy's pride. He and Fred particularly enjoyed teasing Percy and their younger brother Ron, while they were especially close to their sister Ginny, who was similar to them in temperament. However, they were protective of their siblings, and eventually extended this familial protectiveness towards Ron's friends Harry Potter and Hermione Granger (who later became their in-laws). Although not a high achiever academically, George was a very clever, talented, and creative wizard. In fact, he and Fred once attempted, before being of age to go to Hogwarts, to cast an advanced spell like the Unbreakable Vow with their younger sibling Ron (and would have succeeded if their father had not discovered the attempt). Harry Potter once expressed bewilderment as to how he and Fred received only three O.W.L.s each, remarking that they "really know their stuff". When the twins turned seventeen, they were able to use magic outside of Hogwarts, and took full advantage of this. They did everything by magic and frequently Apparated around 12 Grimmauld Place and the Burrow, much to their mother's irritation. Flying: George was a highly talented Beater for the Gryffindor Quidditch team since his second year. Oliver Wood described the twins as "unbeatable" and Harry Potter thought that they flew like two "human Bludgers". George was an excellent flyer with highly precise aim. After the twins left Hogwarts, Harry lamented that he was never able to find replacements as talented as they were for the team. Charms: One of the few O.W.L.s George bothered to achieve was in Charms, a subject he and Fred were extremely talented in. Their skilled spellwork was necessary for many of their magical inventions for Weasleys' Wizard Wheezes. Charms professor Filius Flitwick was so impressed by their Portable Swamp that he left a portion of it intact within Hogwarts. Spell Invention: George was capable of inventing spells, potions, and other magical products, a highly advanced and rare skill. Along with Fred, George invented a wide variety of items for their shop. Some notable items include Extendable Ears, which can be used to spy on others, a series of sickness-inducing sweets, and Patented Daydream Charms, which Hermione Granger considered to be "extraordinary magic". The twins also invented items for Defence Against the Dark Arts rather than pranks, such as Decoy Detonators and Shield Hats; the latter were purchased by the Ministry of Magic itself for its employees as a protection method during the Second Wizarding War. Transfiguration: George was highly skilled at Transfiguration; it was one of the few O.W.L.s George ever tried to achieve. Defence Against the Dark Arts: George was highly skilled at Defence Against the Dark Arts; he achieved an O.W.L. in it and further improved his skills in Dumbledore's Army. George's talent at defence would contribute to his ability to invent Defence Against the Dark Arts items with Fred such as Decoy Detonators, and to obtain rare and useful defence items such as Peruvian Instant Darkness Powder. The twins also joined the Order of the Phoenix at a young age, and participated in a number of its operations. He fought in the Battle of the Seven Potters, during which he lost an ear by Severus Snape; however, Snape was aiming a Death Eater. George also fought in the Battle of Hogwarts, during which he was in charge of guarding the school passages, along with Fred. Hogwarts Secret Passageways Expert: Ever since the twins swiped the Marauder's Map from Argus Filch's office, they had a great knowledge of all of Hogwarts grounds including the secret passageways. Fred even once commented that the Map had taught him more at school than the professors had. The twins' knowledge of the grounds were second only to the Marauders. They seemed to have memorized the Map entirely, as they gave it to Harry in his third year and still remembered everything. This knowledge allowed George to tell Hermione Granger where the Hogwarts kitchens were, and for him and Fred to lead the defence of the school's secret passages during the Battle of Hogwarts. Ron Weasley: "It would have taken you about thirty seconds longer to walk down the stairs." Fred Weasley: "Time is Galleons, little brother." Apparition: Fred and George managed to pass their Apparition tests sometime prior to their final year in Hogwarts, apparently "with distinction". To celebrate their coming of age of being allowed to use magic outside of school, as well as making traveling a close distance easier, they both took to Apparating as often as possible, even over very short distances. Muggle Tricks: Despite being pure-bloods and raised entirely in the wizarding world, Fred and George recognised the usefulness of certain Muggle abilities, and mastered several skills that they found amusing or useful, such as lock-picking. As such, they launched a line of Muggle tricks in their shop, "for freaks like Dad", according to Fred, even though it was not much of a seller. This may have been influenced by their father, Arthur Weasley, who was very interested into Muggles. This also demonstrates Fred and George's ingenuity, as not many people born into the magical world are familiar with Muggle devices or skills. Skilled Duellist: George was a skilled duellist who along with Lee Jordan defeated the Death Eater Yaxley, during the Battle of Hogwarts. He also fought in Battle of the Seven Potters where he lost his ear. He survived the Battle of Hogwarts and the war. Despite being cornered by the Inquisitorial Squad and Umbridge, he and Fred fought their way out of Hogwarts, jinxing many Squad members. Wand: The wood and core is unknown. Most likely, this was bought second-hand, as are most of the Weasley possessions. Assuming that it was bought at the age of eleven, before beginning their education at Hogwarts School of Witchcraft and Wizardry, it would've been purchased in 1989. It is probable that George's wand was more suitable for Transfiguration work, because of his choice in subjects. The Marauder's Map: Along with Fred, George "nicked" the Marauder's Map from a drawer in Filch's office, during their first year. Sometime between then and 1993, he and Fred figured out how to unlock and erase the Map. He used they map ever since until 1993, he gave the map to Harry Potter in order for him to sneak into Hogsmeade. Cleansweep Five: George and his twin each flew on a Cleansweep Five when they played as Beaters for the Gryffindor Quidditch team. Their use of such outdated broomsticks was likely due to their family's financial problems. Despite this, the twins are still very skilled in flying and as Beaters.Draco Malfoy, "who could always afford the best," insulted Fred and George's vintage brooms by saying that a museum would bid for them. Their brooms, along with Harry Potter's, were confiscated by Dolores Umbridge when they assaulted Malfoy for insulting their families. After the twins released a Portable Swamp in defiance to the woman, they used a Summoning Charm to retrieve their brooms from her office, and used them to fly out of Hogwarts as a final act of rebellion. The broomsticks created two rather large holes in Umbridge's door. Joke items: Including the items that he had already made, George owns a large collection of joke items that he had bought from Zonko's Joke Shop to help with their own development and enjoyment for pranks. These include Dungbombs, Dr. Filibuster's Fabulous Wet-Start, No-Heat Fireworks and Stink Pellets. Fred: "— what with Dumbledore gone —"
George: "— we reckon a bit of mayhem —"
Fred: "— is exactly what our new Head deserves." Fred Weasley was George’s twin, best friend, and partner in crime.They were as close as two brothers could ever be. The two would always agree with one another, and never get into any fights or arguments, (at least not real ones.) The two did just about everything together. They often finished each other’s sentences and spoke in a back and forth way that could confuse others at times. They were trouble makers, often pranking their siblings, particularly Ron and Percy, and even sold pranking charms and spells in the boys bathroom. Together, Fred and George designed many ingenious pranks and shared the ambition to found a joke shop together. They were also both Beaters for the Gryffindor Quidditch team and close friends with Lee Jordan. George was devastated by the death of his twin in the Battle of Hogwarts, and would never truly get over this loss. He eventually named his son after Fred. George: "Why aren't you wearing yours, Ron? Come on, get it on, they're lovely and warm." George: "...P for prefect! Get it on, Percy, come on, we're all wearing ours, even Harry got one. And you're not sitting with the prefects today, either. Christmas is a time for family." Like his younger siblings, George tended to look up to his older brothers Bill and Charlie. However, he and Fred delighted in teasing Percy, who was closer to their age and rather stuffy. George was furious with Percy when he fell out with the family over their father’s support of Albus Dumbledore and Harry Potter instead of the Ministry, but the family reconciled just before the Battle of Hogwarts began when Percy apologised for his mistakes. George and Fred also enjoyed teasing their only younger brother, Ron. Ron’s phobia of spiders derives from a prank the twins played on him when he was young. They also teased him over things such as his embarrassing crush on Fleur Delacour. After Fred's death, Ron helped George run the joke shop for a time. George was quite close to his sister Ginny, who was similar to the twins in temperament and also liked to tease Ron. They were protective of her, as well, often disapproving of her love life. Like most members of the Weasley family, George got on well with his parents. Mrs. Weasley was often unhappy with the twins' lack of seriousness and commitment to his learning. She was unhappy with both their earning of only three O.W.L.s and desire to own a joke shop. Mrs Weasley was very upset when she first saw George's cut ear, and thanked Remus Lupin, who saved George from Death Eaters. Mr. Weasley was more laid back than his wife. While not overly supportive of George and Fred's wrongdoing, he seemed to encourage the trying of new things. Mr. Weasley was excited when informed of George's adventure rescuing Harry Potter from the Dursleys and only pretended to be strict. He was upset by George's injuries after the Battle of the Seven Potters, but also very glad that George survived the battle. After the war, Mr. and Mrs. Weasley had two grandchildren through George and his wife, Angelina Johnson . Fred: "We've come to give you a bit of festive cheer before we go..."
George first met Harry Potter in his third year at Hogwarts, when Harry was beginning his first year and became friends with Ron. The twins became friendly with him when he joined the Gryffindor Quidditch team as their Seeker, giving them hope to win the House Cup. The following year, George and Fred cheered Harry up when many of the students believed that he might be the Heir of Slytherin, which they scoffed at, and the year after that, they gave him the Marauder's Map to help him sneak into Hogsmeade. They also stood up for Harry when others doubted his claim that Lord Voldemort had returned or challenged his authority in Dumbledore's Army, and assisted him in contacting Sirius Black when he told them and Ginny of his desire to speak to his godfather. Both twins risked their lives in the operation to remove Harry from his relatives’ home in 1997. They seemed to regard Harry almost as another younger sibling, and were inclined to both be protective of him and teasing of him. Harry was very upset by George's injuries after the Battle of the Seven Potters. He eventually became George's brother-in-law through his marriage to Ginny. Hermione: "If you don't stop, I'm going to--"
George became friendly with Hermione Granger after she became a close friend to his younger brother Ron. Although Hermione disapproved of some of the twins’ antics, since she was a Prefect, she generally got on fairly well with them. They were outraged when Draco Malfoy called her a “Mudblood” in 1992, to the point of attempting to physically attack him. Hermione also warned Fred and his twin brother that their Ageing Potion wouldn't trick the age line protecting the Goblet of Fire due to the fact that Dumbledore would have thought of a foolish ageing potion in advance. They found out she was right when they were blown backwards and grew long, white beards. George and Fred also tried to get Hermione to relax, joking around with her about things such as their late uncle Bilius’s penchant for making mischief at weddings. Hermione also admired the twins’ cleverness and creativity in their spell work, once remarking that they could do some "extraordinary magic", though she did not agree with how they put it to use. Hermione was also one of the few people willing to stand up to the twins when she disagreed with them. For example, when she caught them testing sweets from the Skiving Snackbox on first-year students with Lee Jordan, she was furious, and told them off for what she considered taking advantage of innocent children. George and Fred initially scoffed at her concerns and at her ability to make them stop, but backed down when she threatened to tell their mother. However, the twins did not seem to hold a grudge, as they continued to be friendly. Hermione would eventually become George's sister-in-law through her marriage to Ron. George was friendly with Angelina Johnson, a Gryffindor in his year and fellow Quidditch player, during their school years. She attended the Yule Ball with his twin brother Fred in 1994. After Fred’s death and the end of the Second Wizarding War, she and George evidently grew closer, and eventually married and had two children together, one of them named after George's late twin. Minerva McGonagall was the Transfiguration teacher during George and his brother, Fred's years at Hogwarts. Although McGonagall was always well known for being strict and stern, she was never shown punishing or even telling off Fred and George for their wild behaviour and many pranks. It was known however that they were good Quidditch players from a good family, and she was visibly displeased with having the twins and Harry kicked off the Gryffindor Quidditch team. McGonagall often perceived the twins as naughty but seemed to share their dislike of Dolores Umbridge, who was the Defence Against the Dark Arts teacher for a small time. McGonagall did not attempt to remove the fireworks that surfaced around the school causing great disruptions. When George made his legendary escape in 1996, McGonagall assisted Peeves to unscrew an overhead chandelier, in an obvious homage to Fred and George. Lee Jordan was best friends with Fred and George during his time at Hogwarts, and often got into trouble along with them. In 1995 he joined Dumbledore's Army and helped the twins harass Dolores Umbridge, one incident of which resulted in him being punished by "writing lines", scarring his hand. Lee Jordan also attended Fleur and Bill Weasley's wedding, and danced with Ginny Weasley in 1997. On 2 May, 1998, Lee returned with Fred and George to fight in the Battle of Hogwarts. After Fred's death, George and Lee both defeated the Death Eater Yaxley. Fred and George had a good relationship with most Hogwarts professors. Professor Filius Flitwick, the Charms professor, seemed to like them; he was very happy by their spell work. He also thought that they were very talented wizards, and started to support them, becoming against Dolores Umbridge in 1995. When Fred and George set off fireworks around the ground she spent a day running around putting them out. After she had done Flitwick's classroom, he told her that he could have put them all out easily but was concerned he didn't have the authority to do so. After Easter break, the twins used one of their inventions, a Portable Swamp to change a corridor into a swamp and then shortly afterwards they departed from school to go into the world of business. Flitwick was seen cheering and supporting them at their departure after they ran rings around Umbridge and Filch. Flitwick was asked to remove the swamp they created, which he did but left a small patch in the corner as he believed it to be really good magic. Fred and George were friends with Rubeus Hagrid, the Care of Magical Creatures professor,during their time at Hogwarts. Hagrid seemed to be one of their favourite members of the staff, as he was not too serious, unlike many other professors. They were also among the few people who believed that Hagrid was a great person even after they learned that he was a half-giant. Hagrid also thought that Fred and George were trouble-makers, but very funny. He once compared them with Harry Potter's deceased father James and his best friend Sirius Black. Furthermore, they were all among Harry Potter's closest friends. Fred and George fought in the Second Wizarding War along with Hagrid. However, Fred was killed in the Battle of Hogwarts, during an explosion. It is possible that Hagrid was very sad when he learned about that. Both Fred and George appeared to like the Headmaster Albus Dumbledore and thought that he was the greatest wizard of all time. He seemed to like them, too, despite that they were trouble-makers, and he knew they were good persons. Along with his twin, George joined the Order of the Phoenix, an organisation founded by Dumbledore, in order to oppose Lord Voldemort and his Death Eaters as well as Dumbledore's Army to oppose Dolores Umbridge and the Ministry of Magic. Fred and George both showed loyalty to Dumbledore by punishing Umbridge after Umbridge became headmistress. Fred and George disliked Severus Snape the potions master. Snape disliked them, too. This could be because of the fact that the Weasley twins were trouble-makers, like Snape's schoolboy rivals the Marauders, especially James Potter I and Sirius Black. Snape was eventually charged with being Death Eater; however, he was a double agent and working for the Order of the Phoenix. He accidentally hit George with a Sectumsempra, while aiming at a Death Eater during the Battle of the Seven Potters. George possibly learned that Snape was on their side during the Battle of Hogwarts. The twins also disliked Argus Filch, the caretaker. Filch had punished them many times during their Hogwarts years, because they were trouble-makers. Fred and George also "nicked" the Marauder's Map from Filch, while they were in his office. Filch also had a great knowledge of all Hogwarts' secret passages, only less than Fred and George's. When Dolores Umbridge was appointed at Hogwarts, Filch supported her, and tried to punish the twins again. Fred and George hated Dolores Umbridge, who was appointed by the Ministry of Magic as the Defence Against the Dark Arts professor in 1995. Umbridge was a sadistic woman who enjoyed punishing and torturing students. Almost every resident of Hogwarts at the time hated Umbridge, but she particularly hated Harry Potter and Fred and George. When George and Harry attacked Draco Malfoy, Umbridge kicked them off the team, along with Fred (although their bans were lifted immediately following Umbridge's removal from the school). Fred and George were the ones who opposed Umbridge. They also created a Portable Swamp, in order to anger Umbridge. When she attempted to punish them, Fred and George insulted her in front of the whole school and then fled with their broomsticks. After the war, Umbridge was imprisoned in Azkaban, for her crimes against muggle-borns. In 1995, George and Fred joined Dumbledore's Army, an organisation founded and led by Harry Potter, in order to oppose Dolores Umbridge and teach Defence Against the Dark Arts to the other students. The twins knew most of them, and they had a good relationship with most members of the army, including Harry Potter, Hermione Granger, Ron Weasley, Ginny Weasley, Lee Jordan and Angelina Johnson. Some members of the army were also members of the Gryffindor Quidditch team, including Alicia Spinnet and Katie Bell. The girls appeared to be close with George, whom they possibly knew since their first year, as well as his brother, Fred. Both of them were very upset when Umbridge kicked Harry and the twins off the team. George met them again when they fought at the Battle of Hogwarts in 1998 and they possibly survived the war. Other members of the army were Neville Longbottom, Luna Lovegood, Dean Thomas, Seamus Finnigan, Lavender Brown, Parvati and Padma Patil, Colin and Dennis Creevey, Ernie Macmillan, Hannah Abbott, Justin Finch-Fletchley, Susan Bones, Cho Chang, Anthony Goldstein, Michael Corner, Terry Boot, Marietta Edgecombe and Zacharias Smith. George was friendly with them, although not very close; however, he disliked Zacharias Smith, who didn't believe that Voldemort had returned, and did not fight at the Battle of Hogwarts, as did Marietta Edgecombe, who betrayed the army to Umbridge. However, the rest of them fought for Dumbledore's Army, and at least one of them, Colin Creevey, was killed by Death Eaters. George also became a member of the Order of the Phoenix during the Second Wizarding War. The Order was an organisation led by Albus Dumbledore in order to fight Lord Voldemort and his Death Eaters. George had a good relationship with most members of the order. He and Fred were both friends of Sirius Black. Sirius was friendly with them, but he argued with the twins (for example: when he told them to wait at home while their father was in danger). Sirius was killed by Bellatrix Lestrange during the Battle of the Department of Mysteries in 1996. The twins were saddened by his death, but tried not to remind Harry about it. They were also friends of Remus Lupin, whom they first met in 1993, when he was Defence Against the Dark Arts professor. They considered him among the best teachers of this lesson they had ever had. Lupin fought with the twins in many battles of the Second War, and was killed in the final battle, along with Fred. Their bodies were put near each other's in the Great Hall. Another member of the Order that they knew was Nymphadora Tonks. Tonks and the twins were close in age, and they were friendly. They fought together in the Battle of the Seven Potters and the Battle of Hogwarts. Tonks was killed during the final battle, too. Her body was put near Fred's, as well as Lupin's, after their death. The twins also knew Alastor Moody and Kingsley Shacklebolt. They appeared to have a good relationship, although they were not very close. When Moody was killed by Voldemort, everyone was sad. Before the twins learned about it, they were joking with each other. They immediately stopped talking once they heard Moody died, and their expressions immediately switched to sadness. Kingsley survived the war and became Minister for Magic. After the Second Wizarding War, George married Angelina Johnson and together they had two children; Fred, who was named after his late twin brother, and Roxanne. George possibly had a good relationship with his children, and joked in front of them, as Ron did to his children. George had also several nieces and nephews through his siblings: Victoire, Dominique and Louis, Bill and Fleur's children; Molly and Lucy, Percy and his wife, Audrey's children; Rose and Hugo, Ron and Hermione's children; James, Albus and Lily, Ginny and Harry's children. It is supposed that George had a good relationship with his nieces and nephews, and that they liked him. James also appeared to act like George, because they both enjoyed pulling pranks and teasing their siblings. George is a popular male given name derived from the Greek word γεωργος (georgos), meaning "farmer" or "earthworker". Saint George was a third-century martyr who became a patron saint of England after the Crusades. Six kings of Britain have borne the name George. Other famous bearers include the composer George Frideric Händel, first American president George Washington, two kings of Greece, and explorer George Vancouver. It was also the pen name of English writers George Eliot and George Orwell. J. K. Rowling described Fred and George as "the risk-takers in the family... who just take a totally different life path and were prepared to risk everything". 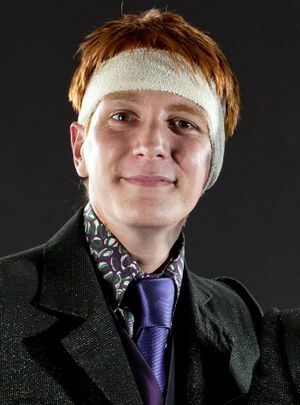 George is portrayed by British actor Oliver Phelps in the film adaptations of Harry Potter and the Philosopher's Stone, Chamber of Secrets, Prisoner of Azkaban, Goblet of Fire, Order of the Phoenix, Half-Blood Prince and Deathly Hallows: Part 1 and Part 2 and so is one of the 14 characters to appear in all 8 film adaptations. There has been some suggestion that George and Fred are named after their maternal uncles, Fabian and Gideon Prewett, who were killed in the First Wizarding War, who may have been twins, and who share George and Fred's first initials. It is possible that he and Fred were the basis for Kaoru and Hikaru Hitachiin, a pair of mischievous, red-haired twins from the shojo manga, "Ouran Highschool Host Club." Daniel Radcliffe plays George in the "Seven Potters" scene. George and Fred earned fewer O.W.Ls combined than each of the rest of their brothers separately. George and Fred were the only sons of Arthur and Molly Weasley who did not become prefects during their education at Hogwarts. In the novels, J. K. Rowling described the twins as "shorter and stockier" and Percy and Ron as "long and lanky", but in the film, Fred and George were a lot taller and lankier than Percy and Ron. George Weasley's O.W.L. results have not been specifically stated by name; he had mentioned in Harry Potter and the Order of the Phoenix that he had an inspected Charms lesson, and that he and his brother Fred were going to sell extendable ears before Herbology. Lee Jordan also mentioned that they played Exploding Snap in Defence Against the Dark Arts. Since they only passed three subjects, these are most likely the subjects they passed (although it is also possible that the twins chose different subjects to take beyond OWL level and purposely failed other courses to free up their schedules). Rowling has said that George and Fred are among her favourite characters. Unlike Ron, his younger brother, George never got mad at Harry Potter for dating and romancing with George's sister, Ginny. However, George was protective of Ginny. The Weasley twins were born April Fools' Day - April 1. It's traditional to play a prank on someone on this day, which seems to be a particular hobby of Fred and George's. In Harry Potter and the Deathly Hallows: Part 1 it is George who walks in on Harry and Ginny kissing in the kitchen on Harry's birthday, instead of Ron bursting in on them in Ginny's bedroom. It is interesting to note that the only times Fred or George have been injured were when they were apart. They were split up at the time of Fred's death and when George lost his ear. ↑ By Molly Weasley after he loses an ear. ↑ George took Poly-juice potion to be one of the Seven Potters in Harry Potter and the Deathly Hallows. ↑ Fred called him this, in this broadcast of Potterwatch. ↑ In his later teenage years, Harry Potter was said to be "within an inch" of his father's height, and James Potter was described as being tall. When Fred and George took Polyjuice Potion to take on Harry's appearance during the Battle of the Seven Potters, they shrunk, indicating that they are taller than Harry. ↑ Fred and George mentioned having a Charms lesson to be inspected by Dolores Umbridge in their seventh year. ↑ Minerva McGonagall, the Transfiguration professor, told him to continue transfiguring his racoon in 1994, the year after he finished his O.W.L.s. ↑ George was told off for playing Exploding Snap in Dolores Umbridge's class, year after O.W.L.s. This page was last edited on 29 June 2015, at 19:15. This text is available under the GNU FDL and may have been adapted from the Wikipedia article about George Weasley (history).